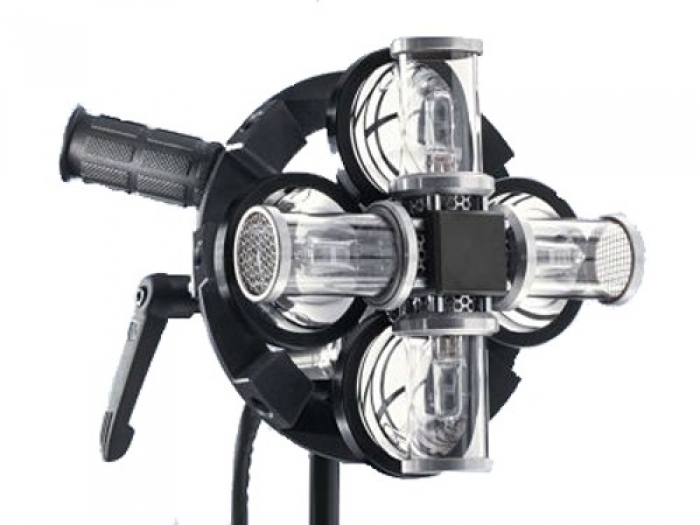 A dedicated soft light for feature films or television series. This soft light contains four 150 W lamps with reflectors in one unit, providing light output just shy of a soft box mounted to the front of a 2 K Fresnel. Used with small, medium or large soft boxes, the light level at a given distance remains unchanged even though the size of the diffuser surface changes drastically. The illumination of the diffuser is perfectly even whether one lamp or all lamps are in operation. Depending on the power option used, the four lamps can be dimmed individually alowing infinite variation of warm tone effects. This light weight head does not require heavy mounting accessories. Great versatility of powering options. Requires DT4x150, DT24-3 or DT12-4 power supply.